Nate Watters wrote a blurb and posted a dozen fabulous photographs in CityArts about Hollow Earth Radio’s Magma Festival. Curated by Steve Peters, co-founder of Nonsequitur, the event included four sets of improvising trios: trumpets, clarinets, strings and percussion. He called it 4 x 3. I was lucky to be part of the string trio. It was my first-time playing music with cellist Paul Rucker and a lovely opportunity to continue working with violinist Tari Nelson-Zagar. See full article at CityArts. 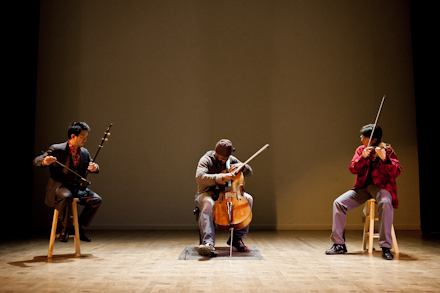 Byron Au Yong composes songs of dislocation, music for a changing world. 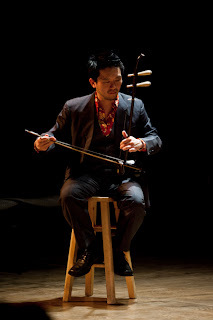 He is an Assistant Professor of Music in Performing Arts & Social Justice at the University of San Francisco.